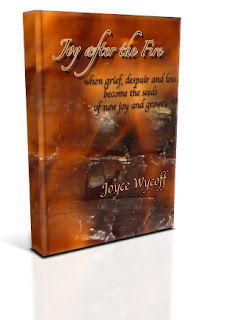 Joyce Wycoff Connecting through Art: Joy after the Fire: It's a book! The past five years have been an amazing journey, even though it was not one I would have chosen. The story of this journey is now available in my book "Joy after the Fire, when grief, despair and loss become the seeds of new joy and growth" available for iPads from iBookstore and as a downloadable pdf by clicking the BUY NOW button on the right. Loss comes to each of us, and, in the beginning, it just feels like pain, grief and despair. Gradually, however, the pain begins to lift and we can choose once again to live. For me, there was no way to live my old life so I wound up in what felt like a free fall ... which landed me in an art workshop in Mexico that changed everything. The purpose for telling this extremely personal story is to help others who may be experiencing loss. I want people to know that there is definitely joy after the fire ... but it's not always easy. The path to that new joy winds through a forest of self-reflection ... finding what brings you joy, stepping onto that path regardless of what the world thinks you should be doing, learning to be grateful for even the smallest things that gladden your heart. At the end of each chapter and "interlude," there are questions to help you look at your life and your choices in new ways. There is more about the book on the Joy after the Fire menu bar above and I would love to have you post your comments on that page. Feel free to tell your story and tell us what has helped you. What you say has the power to help others. May your path to joy be filled with great friends and new insights about your own magnificence. Oh, Joyce; congratulations many times around!! So delighted for you. Joyce, Enhorabuena y Felicidad! - Congratulations and Happiness!, I'm truly honored and touched...to hear this makes all that I do here at the Casa and my teaching worthwhile. Thank you for sharing and being a part of the Casa Experience. -Bob Masla, Casa de los Artistas, Boca de Tomatlan, MX. Maureen ... thanks for being such a lovely part of the journey. Bob ... I'm sure the people who have been touched by staying at your beautiful Casa de los Artistas are legion ... a very lucky and inspired legion. Best always. Can I download it on my Nook?